It is well known that the US tried to kill Fidel Castro, but recently released JFK assassination-related files show that the Pentagon actually planned to use biological weapons against the entire country, killing plants and animals in order to ruin its economy and effect regime change. Was Russia Behind Cuba Sonic Attacks? Was there some sort of attack on US embassy personnel in Havana? If so, who stands to gain? Certainly not Cuba. Now a similar incident in another part of the world points to a familiar foe. Will Fidel Castro’s death ring in a new era with regard to US-Cuba relations? One thing is certain: The embargo of the small island nation has not resulted in the desired regime change — just hardships for its population. As Cuba warmly welcomes President Obama, we think back to the secret, shameful things done in the past by the US to ruin Castro. Here, we report on one of the more hair-raising schemes. With President Obama’s historic visit to Cuba, this new documentary on the US-Cuba relationship and the embargo couldn’t be more timely. A WhoWhatWhy exclusive. This is a complex story, as fascinating as it is appalling. It is about how the CIA and FBI suppressed a major clue to the existence of a pre-JFK-assassination conspiracy. And about how alleged evidence of Lee Harvey Oswald in Mexico was manipulated and altered by elements in the CIA and their Mexican clients, the Dirección Federal de Seguridad (DFS). Sixty-two years after the Cuban Revolution began and 53 years after they were severed, diplomatic ties between the US and Cuba have been restored. Tom Hayden, a leader in the student, antiwar, and civil rights protests throughout the 1960s talks to WhoWhatWhy’s Jeff Schechtman about what this new opening might mean. What possible connection could there have been between George H.W. Bush and the assassination of John F. Kennedy? Or between the C.I.A. and the assassination? Or between Bush and the C.I.A.? For some people, apparently, making such connections was as dangerous as letting one live wire touch another. Here, in anticipation of the 50th anniversary of the JFK assassination in November, is the first part of a ten-part series of excerpts from WhoWhatWhy editor Russ Baker’s bestseller, Family of Secrets: The Bush Dynasty, America’s Invisible Government and the Hidden History of the Last Fifty Years. The story is a real-life thriller. The Jeb Scenario: Can You Say “President Bush” again? 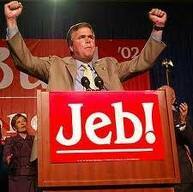 Could we see a third Bush in the White House? You betcha—and soon. This is not just of casual interest—there’s a lot more than meets the eye. And it explains a lot about the death of democracy.